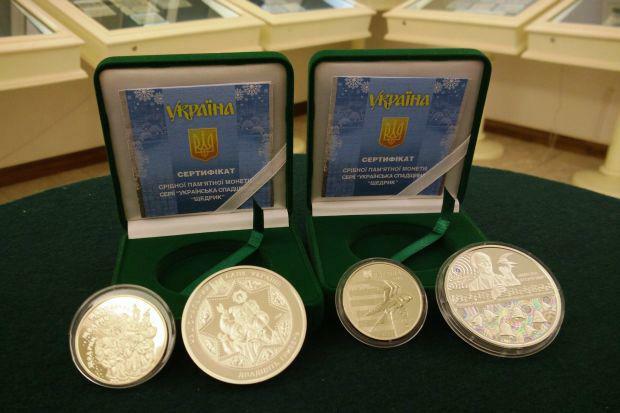 The National Bank of Ukraine (NBU) January 5, 2016 issued two commemorative coins "Shchedryk" (New Year's carol) with a nominal value of UAH 5 made of nickel silver and UAH 20 made of silver. 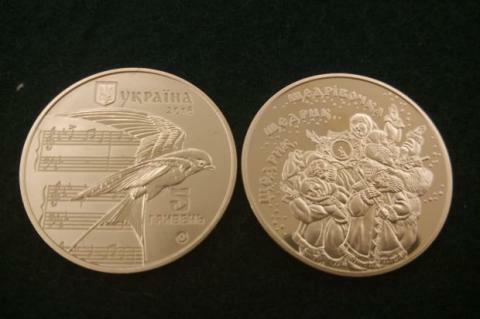 "Shchedryk" coins continue the series titled "Ukrainian Heritage," dedicated to the 100th anniversary of the first performance of "Shchedryk" by a Ukrainian composer and innovator, the master of choral miniatures, the author of nearly two hundred folk songs arrangements Mykola Leontovych," a statement reads. It is noted that "Shchedryk" is one of the most popular arrangements of Leontovych, to which the composer devoted almost all of his life, and which is known not only in Ukraine but all over the world as Carol of the Bells, or Ukrainian Bell Carol, or Ukrainian Carol. 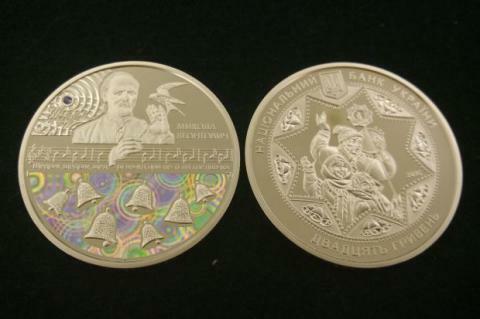 "The silver coin (with case) costs UAH 1,370, the coin made of nickel silver – UAH 38. The coins have a mintage of 3,000 and 50,000 pieces, respectively," according to the report. The abverse of the nickel silver coin features the relief image of a swallow on a background of music lines, the reverse side pictures a group of singing people called Koliadnyky, with one of them holding a Christmas star with an inscription - Shchedryk, Shchedryk, Shchedrivochka. The silver coin is decorated with a blue gemstone (cubic zirconium oxide 2.0 mm in diameter) and a colorful holographic image.